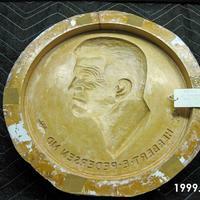 Round plaster mold for Herbert Pedersen portrait. The mold has the mold rims attached with tape. The yellowish discoloring is from shellac used to seal the plaster. 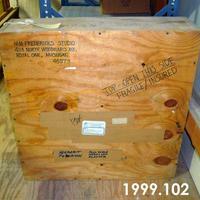 This medallion of Herbert Pedersen is in a wood crate with "Herbert Pedersen Full-Scale plaster medallion" written on crate along with shipping information. 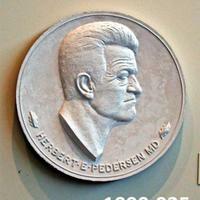 Herbert E. Pedersen MD was a well-known Detroit physician. He was associated with the Detroit Medical Center. Both Hutzel Hospital and the Children's Medical Center have a memorial lectureship in his name. This plaster model was used to create the mold for it to be cast.